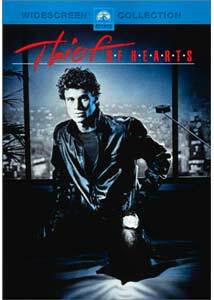 From the first moment it begins, Thief of Hearts firmly dates itself to the early 1980s; from the synthpop musical score by Harold Faltermeyer, to the overpowering flash and style of an early Don Simpson/Jerry Bruckheimer production. I mention this because the film is actually clever on many levels and has a very interesting premise, but ultimately feels so distinctly part of certain kind of period-based movement in cinema (the "new-wave" thriller), that it's hard to get into. There's an admirable soul to Thief of Hearts, but it's hard to absorb with all the fluff and filler surrounding it. I suppose in its day, this wouldn't have been a flaw, but ultimately, some movies need to allow themselves to extend beyond the age in which they're made, and this one can't. Scott Muller (Steven Bauer) is a professional thief whose partner Buddy (David Caruso) works at a posh restaurant picking out people to rob. One evening, Muller breaks into the home of Ray and Mickey Davis, an average but wealthy couple. Amongst the goods he snatches is Mickey's diary, which begins to fascinate him greatly. While the Davis couple go through feeling as if their lives have been violated, Muller is all the while absorbing Mickey's intimate thoughts, most of which deal with how she is, in reality, dreadfully unhappy. After reading through the entire book, Muller decides to use his inside knowledge of Mickey to seduce her into having an affair, sure that he can get away with it since he knows her psyche so well. The premise is a good one, and creepy to boot. Eventually, Muller and Mickey's relationship threatens to become dangerous, as Muller's partner sets to destroy it. While Muller is involved this way, he's not longer committing crimes, which means Buddy is stuck having to buy his cocaine and hookers on his own, which drives him into a frenzy. The story is solid and, in some ways, works quite well. The problem is in the completely overdone stylization of the project. It drips with the kind of 1980s flavor that was ushered in by directors like Michael Mann and Adrian Lyne, except those directors knew how to handle their own creation. Here, though, Douglas Day Stewart (An Officer and a Gentleman) seems simply to be co-opting moody visuals and Miami Vice-style atmosphere to make Thief of Hearts seem more complex than it actually is. I suppose this bothered me because, in a way, Steven Bauer and David Caruso's characters are glamorized by this approach when they're actually very creepy, surreal characters. There was a potential for a very frightening and radically disturbing film here, but the silly elements get in the way. The end result is basically a romance film that loses sight of where it wants to go, and peters out towards the end, simply introducing a threatening aspect (the Buddy character) to spice up things and give a violent conclusion, which seems odd given that if anyone should be a threat, surely Mickey's husband fits the bill. It isn't entirely bad, and it actually showcases some compelling performances. A more bland and realistic touch would have made it much more unsettling. Image Transfer Review: There are really no complaints about the transfer, which nicely renders all the color schemes and shifting styles with good precision, despite some heavy grain here and there. The source print is a bit scuffed up, but not really enough that it effects the overall quality. For a relatively unpopular film dating to 1984, this is a very nice, smooth, anamorphic transfer that handles the dark nature of the cinematography very well. Audio Transfer Review: The Dolby 5.1 track isn't very heavy on surround effects, but does feature a very clean, spatialized front soundstage that embraces all the elements very well. The soundtrack becomes very theatrical and powerful, but the mixing was careful enough to not do too much to exaggerate things that wouldn't have been there originally. The Dolby 2.0 Surround track is quite similar, but less crisp and clearly channel-separated. The film isn't very big on a lot of activity anyway, so in both tracks the music is really what takes most of the effort anyway. Extras Review: Other than English subtitles, there are no featured extras. The menus are basic without any animation or flair, and presentation is basic (though Paramount kept the original poster art for the cover). Thief of Hearts is certainly worth a glance for those who've never seen it before, but ultimately, its heavy-handed "neo-thriller" attitude might drive away anyone who might normally have been impressed by the content.